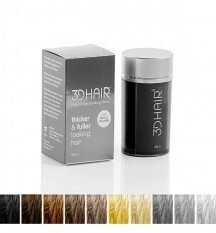 3DHair formula is perfect for people with thinning hair and bald patches. 3DHair will eliminate bald spots and thinning hair in seconds giving you natural looking thicker hair without any sign of hair loss. Now every one Can Buy Toppik Hair Building Fiber at Wholesale price from us. Its Is very good product who suffering from Hair Loss , Baldness , Hair Thinning. Hair Building Fibers are all natural hairs made up of keratin protein that bind to your own existing hair to instantly make your hair look fuller and thicker. All fibers are made from a plant called Moroccan Gossypium Herbaceum. The fibers from this plant have surface optical properties very similar to human hair. This product is rich in cacumen platycladi extract ginseng extract, ginger extract and other nutritional essence for deep nourishing the hair roots and hair follicles, helping to reduce excessive hair fall and strengthing the hair. Make your Hair thicker and fuller in 5 seconds! The perfect, temporary solution to hair loss, thinning and bald spots! These natural Hair Building Fibers cover up scanty areas on the scalp to give the effect of a full head of hair. Trendz natural hair building fiber is the quickest way method to conceal thinning hair and scanty hair. Originally invented for hair transplant customers that wanted to achieve more density, now is a winning product for men and women suffering from thin and scanty hair too.